Yarrow (Achillea millefolium) grows like a weed in Sioux Falls, as it should as a native species (or natural hybrid of native and naturalized introduced species). We’ll talk briefly about yarrow’s edible qualities, but its real magic is in its medicinal properties. Yarrow has teeny, tiny composite flowers with a delicate spicy fragrance. Yarrow flowers can be any of these colors. Yarrow is said to be bitter, but I do not find this to be the case, at least not the yarrow from my garden. Yarrow imparts its own distinct flavor as an herb. My favorite edible use for yarrow is to chop it up into scrambled eggs with garlic, chives, and thyme. The flavor brings up a nostalgia of my Midwestern childhood. I also grab yarrow quite often as I’m gathering greens for smoothies. Another suggestion for use is to add the young, tender greens to salads. You could do the same with the flowers. Yarrows medicinal properties include antiseptic, antispasmodic, astringent, carminitave, diaphoretic, digestive, emmenagogue, stimulant, tonic, vasodilator, and vulnerary. The most popular use for yarrow is as a blood vessel toner. Soldiers used to pack their wounds with yarrow leaves; the astringent property would stop the bleeding and the antiseptic property would prevent infection. A tea or tincture (a solution made by covering the leaves in alcohol and letting it sit for 4-6 weeks) of yarrow can be applied to cotton and inserted into a nostril to stop a bloody nose almost immediately. I infuse yarrow into oils and salves for its antiseptic and healing qualities. An astringent helps tighten and constrict tissues. This makes it good for counteracting inflammation and stopping diarrhea. Yarrow is also useful to take at the beginning signs of a cold to abort the illness. 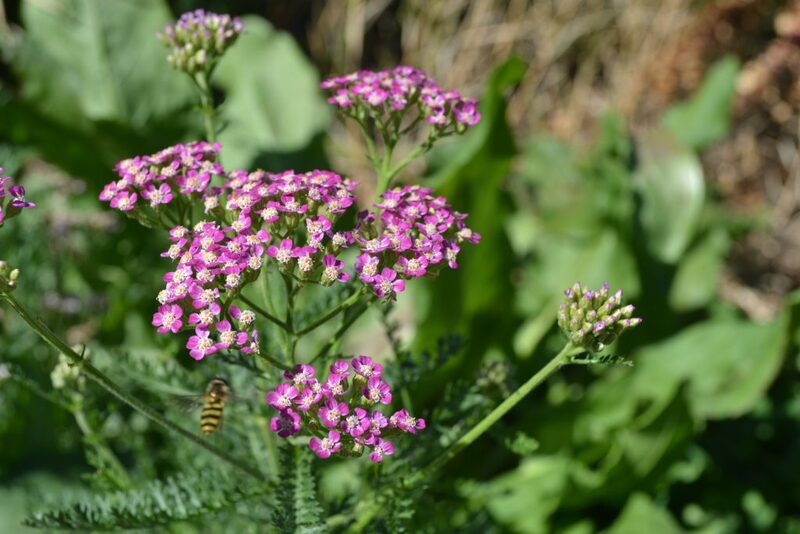 Yarrow tea is tasty plain, with honey, or mixed with other medicinal herbs. My children don’t yet appreciate the taste of yarrow tea, so I just add a dropper of tincture to some juice for them. The flowering parts of yarrow are considered to be the most medicinal, but the whole plant can be used. The flowers can also be used for floral arrangements or dried and used in sachets or potpourri. Yarrow is beautiful, grows easily, belongs in this area, and is extremely beneficial to the soil and insects. It’s also deer resistant. It’s easy to see why we love yarrow at Project Food Forest.